It’s not often you see a good return on savings or fixed deposits in T&T but this offer from DFL is different. And I’ll give you the details in a minute. But first, if you have money in a fixed deposit now you should check when it's maturing so you'll be ready to take advantage of the absolute best savings deal in the country. Now, let me share a bit about why we are making this offer available to you in the first place (besides the fact that, unlike your bank, we actually want to compete for your business). In short, we’re on a mission to encourage more people to save. The truth is, Trinis are not saving anything close to what they should be saving. They’re buying cars instead. And yet, of all the financial tips you hear out there—and we’ve heard them all—saving money is, undoubtedly, the most important one. Your savings is your foundation. Build enough of a cushion and you’re ready to invest some of that money. So to motivate more people to make a commitment to save we plan to be extremely competitive with the interest rates we offer on fixed deposits. The earlier you start saving, the longer you let your money roll over, the better. You deserve a comfortable retirement. You deserve the house you’ve always wanted. You deserve to see your child go to the best university in the U.S. or Canada without worrying about how you will pay for it. Or maybe all you want is the peace of mind knowing money is there when you need it. Years ago you could put your hard-earned cash in a fixed deposit and watch interest rates work their magic. This was before the big banks, with fewer investment opportunities, got so flush with extra cash. And before lending declined across the board causing interest rates to fall. Now, with deposit interest rates averaging less than one percent for the past five years, your money is mostly just sitting there, ticking over. Adjust those already miserable returns for headline inflation which averages 1.3 percent and the money in most fixed deposits isn’t making you nearly as much as you think. It’s worse if you happen to be one of those poor souls who have their money tucked away in a regular savings account. I regret to inform you that, given the rate of inflation—not to mention the fees you’re paying on these accounts—you’re essentially losing money here. Which brings me back to this special offer on fixed deposits, because if you want to see higher returns on your money these days you’re going to have to think long and hard about where you save. Here’s some free advice to start: If you have cash in a regular savings account that you don’t plan to touch inside a year you ought to move these funds to a fixed deposit the first chance you get. But not just any fixed deposit. You’ll want to avoid the ones that only offer you meagre interest income. Fortunately, not all fixed deposits are created equal. Here’s how they stack up. Take a good look at that table again. With the best fixed deposit rates in Trinidad and Tobago, DFL can help you reach your financial goals faster. Say you put $100,000 in a DFL fixed deposit at 3.75 percent—trust me, it’s the highest rate you will find—you will have $120,209.98 after five years. Leave that same $100,000 in a “high-yield” savings account at your bank and you’ll just have $101,004.93. It’s not even close. 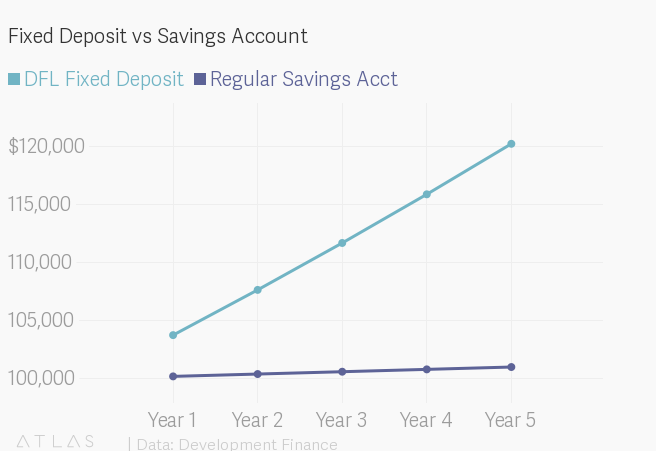 With the fixed deposit, you’d earn more than $20,000 compared to a paltry $1,000 in the savings account. And you want to know the best part? It’s completely risk-free because your money is fully covered by deposit insurance up to $125,000. With options from one to five years, a DFL fixed deposit could be the most beneficial way to grow your savings without taking any unnecessary risks. And DFL's fantastic rates apply to both TT dollar and U.S. dollar accounts. To start, all you need to do is call us toll-free at 800-4DFL (4335) or click the “OPEN MY FIXED DEPOSIT” button to begin the process online. It’s not a complicated process at all. You’ll need two forms of ID, proof of your address and a job letter or pay slip if you still work. For companies, we’ll need your incorporation documents and, if it applies to you, a resolution of your Board of Directors. When we meet, we’ll also help you think through your options to see which fixed deposit account is right for you, and in no time at all you’ll be earning higher interest rates on your savings. Perhaps you’re telling yourself you can’t afford to have your money locked down for a year or more? Well, here’s another way to look at it: for many people, more restrictive accounts are often best. Fixed deposits can save you from yourself by limiting access to your money before a certain time. This makes them ideal for couples who are saving for the long term, say, the down payment on their first home. Which reminds me, a couple opening individual and joint fixed deposit accounts together will have more than $250,000 fully insured by the DIC. You should also know we discourage all our clients from breaking their fixed deposits for anything but a real emergency. But God forbid you do have a real emergency we’ll prorate the interest you earned without any penalty on your principal, which is the original sum you invested. They won’t bring you instant wealth, but structured in the right way, fixed deposits make financial sense for people of all ages looking for a low-risk investment. And these are the best rates you will find anywhere. Call us toll-free at 800-4DFL (4335) or click the “OPEN MY FIXED DEPOSIT” button below to start earning better returns today.